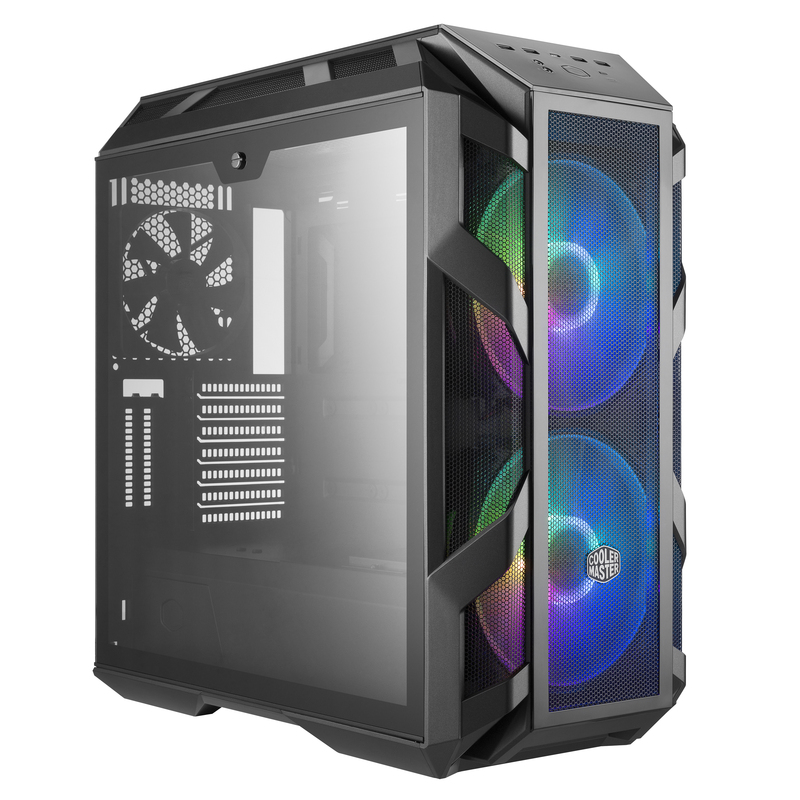 Normally we expect to see product ranges being refreshed after the big trade shows such as Computex, which happens next week in fact, but Cooler Master's latest addition to its MasterCase range of cases is another in a long line of new tempered glass-clad models that are built around a similar chassis, and there are more to come as well. This particular model, like the H500P we reviewed recently, comes equipped with a pair of 200mm RGB fans with the boon of these being addressable with individually-controlled LEDs, but there's plenty more here compared to the H500P for the extra £50 you'll be spending. There are a number of accessories in the box, the largest of which is a tempered glass replacement fascia for the front panel. This can be swapped with the rectangular mesh panel in place out of the box, allowing a clearer view of the front RGB fans as well perhaps lowering noise levels a tad too. However, there are large mesh sections either side of this interchangeable area that should mean the impact on airflow is lessened. It's a nice touch, and while you need to remove the entire front section to do it, it's easily detached, and you'll then be able to get at the screws that hold the interchangeable panels in place. The front panel has a handy four USB 3.0 ports plus the usual buttons and audio jacks, but being a £200 case you expect something more than these, and sure enough, Cooler Master has included a USB 3.1 Type-C port too that uses a proper/Gen 2 connector too and isn't just powered off another USB 3.0 header. The downside to the panel, though, is that it's supremely glossy and attracts dust more readily than Daenerys Targaryen does dragons. We'd much prefer a soft-touch finish here, if only for this reason. The roof comes equipped with a single sheet of tempered glass as standard, and this isn't removable. The case does sport decent water-cooling potential, though, and as there's scope for mounting fans and radiators in the roof, Cooler Master has built-in large mesh sections adjacent to it, again to allow the case to breathe up here, and they're large enough to be relatively effective, unlike some Phanteks cases we've seen where they're just too small to be useful. The underside has the usual removable dust filter for the PSU that pulls out of the rear of the case. The front section requires the entire panel to be pulled off revealing a fixed fine mesh filter underneath, but as we mentioned earlier, that panel comes off relatively easily and doesn't need to be yanked off with a huge amount of force like some cases. The steel and plastic construction is certainly sturdy, but it's a little too plastic-laden for our liking given its price tag, especially when compared to the likes of the MasterCase Maker 5t. Drive bays 2 x 3.5"/2.5", 6 x 2.5"